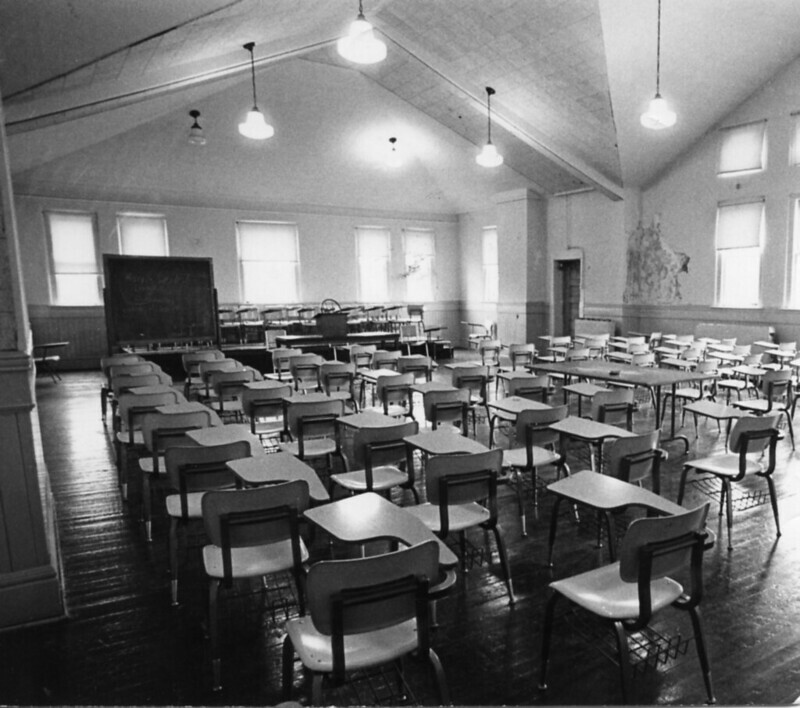 Pictured is a large classroom on the top floor of one of the wings of Alumni Hall, some time after 1960. Notice the crumbling wall on the right. The upkeep and renovations required to keep Alumni Hall going have been an ongoing issue since the first renovations in the 1930s. As early as 1929, students were noticing how old Alumni Hall was, as an editorial in The Knox Student said “As we look at Alumni Hall today, and wonder when we’ll be getting new buildings, perhaps we do not realize the true significance of the old red landmark.” A 1949 memo to Trustees stated that “[$16,615.34] is obviously a considerable amount to spend on a building as old as Alumni Hall.” These issues only worsened as time went on and costs were climbing, which probably explains the bit of broken wall in the classroom. These issues, as well as expanded classroom space in other buildings on campus, eventually led to the decision to “mothball” Alumni Hall. The above photo is a shot of a class taught by Professor Vasili “Bill” Fiedorow in Alumni Hall. Fiedorow taught Russian and French at Knox for more than 30 years, from 1972 until his retirement in 2005. Fiedorow passed away in September 2013. 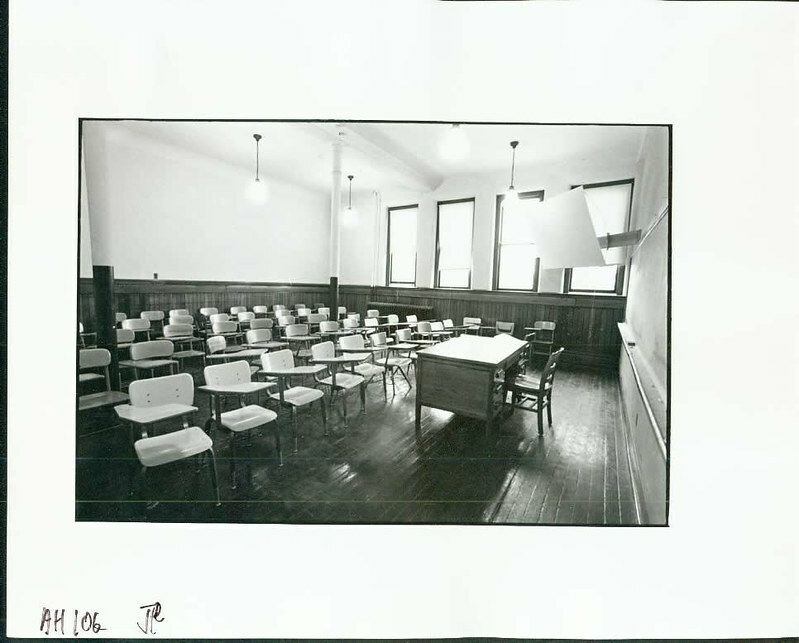 Around the time he started teaching at Knox was when the Modern Languages department was located in Alumni Hall. It remained there until the building’s closing, when it then moved to George Davis Hall. 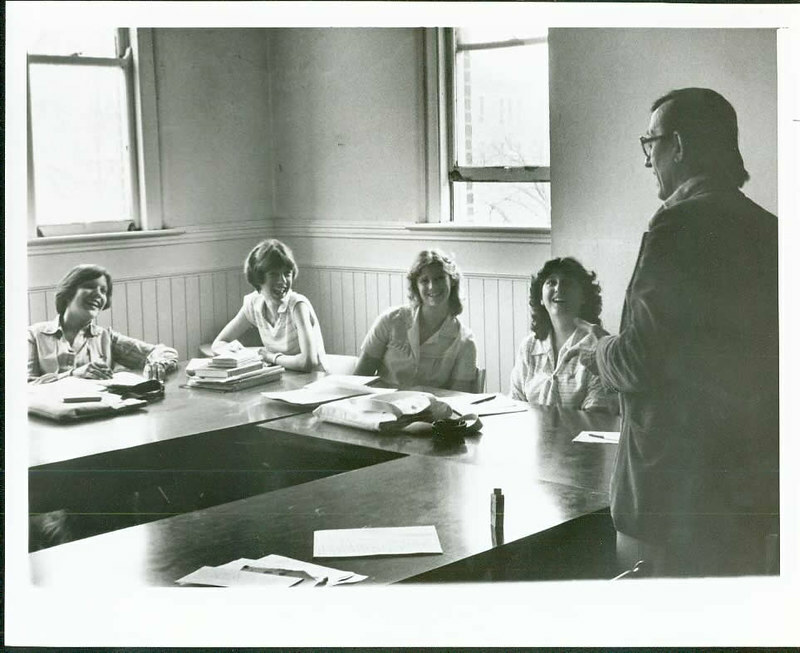 We don’t have a date for this photograph, but judging from the hair styles on these modern languages students, can we agree that it seems safe to place it somewhere in the late 1970s or early 1980s?